It was the sound. A deep rumble in the bones. I sat up and looked out the side the window of the station wagon. I didn’t see what could be making this sound, shaking my core. In my peripheral vision I saw a glimmer. In the westbound lanes of I-90, thundering across the long empty stretches of South Dakota, came a pack of 150 motorcycles that stretched for what seemed to be miles. Most, if not all, were Harley Davidsons. The riders were covered in black leather, road grime, sweat. They wore club patches, goggles, half helmets. Some had passengers on the back, women, similarly clad. I recall a mongrel dog riding in a sidecar; it wore goggles and a red bandana. The dog was smiling. The sound that impacted my young ears was almost deafening. The guttural roar of 15,000 cubic inches of engines racing across the wasteland that is the edge of The Badlands, headed to their Mecca. Headed to Sturgis. It was 1975. I was 7 years old. We were driving back across the country from visiting my grandparents in Montana. I saw more packs of motorcycles making their way west. Each pack thundered by and I gazed in wonderment and awe. The sight of so many bikes and the cacophony they produced stirred something in my soul. That stirring has never stopped. The dis-harmony that a motorcycle generates in me, the longing to be moving, the dis-ease of being still and not being “out there” or “in the world” is what happened in 1975 and still happens today. A child’s play includes many things, most of all, imagination. I had a G.I Joe doll, the big one. He rode a motorcycle, of course. My bicycle became a motorcycle. I had motorcycle Hot Wheels models. It wasn’t a singular focus, because my play included many things; but one of them was motorcycles. Anytime I saw a cycle, my head turned with it as it went by. I would stop and stare at them in the parking lots. It wasn’t obsession yet, but genuine fascination. The idea of the cycle to a child can be ethereal or magic. Like a flying carpet, it transports you quickly, in the wind, exposed to the elements, to your destination. My BMX bicycle became my motorcycle. It carried me around the neighborhood and beyond. To me it was a sleek fast racer on the road and a mudslinging motocross cycle in the dirt. I rode the cycle in my imagination hard and fast, and I wrecked hard several times in real life. The wrecks never deterred me from continuing the ride. Being outside, face in the wind, always beckoned. I always answered. In 6th grade, my friend Sara had access to her family’s moped. She didn’t live far from me and would ride down to my house and let me take the moped out for a turn around the neighborhood. I was finally riding a motorcycle, albeit a very small version. But when I felt the wind in my face and the pavement racing under the tires I knew that riding a cycle was my destiny. I made sure to watch Evel Knievel when he was on Wide World of Sports, jumping cars, busses, and fountains on his motorcycle. I got my mom to let me subscribe to Motocross Action magazine, because I was selling subscriptions for a school fundraiser. I dog-eared the pages to mark the Hondas, Kawasakis, and Yamahas. On occasion I would get to walk through the local Honda dealership. The smell of the showroom — metal, rubber, grease, and a hint of exhaust that crept in from the repair shop — was the smell of heaven. I would slowly walk through the rows of bikes, lingering to stare at the one that caught my eye. I could only dream of what it was to ride such a steed. The power. The excitement. And dream I did. I have two vivid dreams that I remember from my childhood. In one I am on a long airplane trip and sleeping in a bunk bed on the airplane. It was a bit confusing as I had taken trips on airplanes before, but had never seen a bunk bed on a plane. The other dream is of The Motorcycle. It always started with me walking a circle around the bike, looking at it very closely. I would then mount the cycle and settle into the saddle. I would kick-start the bike, rev the throttle and then motor off down the street, face in the wind, smiling. I always liked the cycle dream better than the airplane dream, even though both were pleasant in their own ways. Most of us got our driver’s license on our sixteenth birthdays. Tentatively, our parents handed over the car keys and let us loose into the world. I was handed the keys to the family station wagon. Not really a vehicle that a “cool” 16 year-old wants to be driving, but it was wheels. My best friend, Hack, got a motorcycle. His father decided he needed transportation, and being a motorcycle guy himself, found it only fitting to give his youngest boy a motorcycle as transportation for his high school years and beyond. He had the cycle, I got to ride on the back. I now got to feel the power that a twist of the throttle produced. I got to wear the helmet. I truly was able to put my face into the wind, even if it was just as the passenger. As a passenger I put my trust in the rider completely. I had to follow his lead; lean into the corner time, hold-on for braking, try to anticipate the driver’s actions so as not to upset the balance. I would like to say I became good at it. But on occasion, I would be feeling the wind, watching the scenery, and not paying attention. It became a joke between us as Hack knew I wasn’t paying attention when he would brake and the front of my helmet would THUNK against the back of his helmet. Oops… (that THUNK still happens when I ride with him and we still laugh about it). Some Saturdays, Hack would pick me up and we would go ride. Sometimes we would ride with his dad, sometimes not. But we would go. We would ride into the mountains of West Virginia. By that time, I had travelled a number of roads and had seen many parts of the state, but all through a car window. I was now seeing it from a new perspective and with new sensory input. The change of temperature in the warm spots of the sun, the cool spots in the hollows. Light shifting through the trees. Wonderful smells would sift through the helmet; wildflowers in bloom, horses in the meadow, fresh baked bread, something dead in the ditch, car exhaust, flowing water, fresh air. I was in the wind, exposed to the elements. It rained and I got wet. The temperature dropped as we rode north into higher elevations and I got cold. The sun burst through the fog and the extra layer I put on to fend off the morning chill was now too much. Bugs splatted off my helmet, jacket, and boots. My clothes got covered in road grime and saturated with sweat. And all I could do was smile. My fate was sealed. I was hopelessly in love with the ride. I was at the end of my senior year in college before I actually owned my first motorcycle. 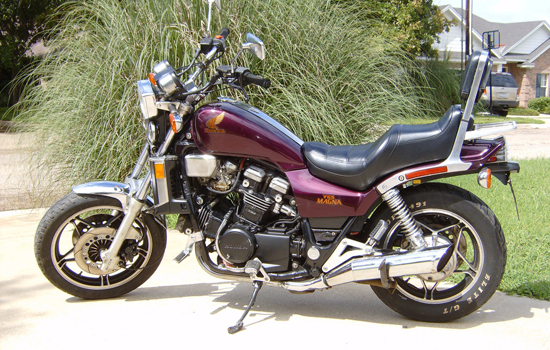 I bought the same motorcycle that Hack’s dad had, the 1983 Honda V65 Magna. It was joyous. And with a twist of my own wrist, I became the rider. At last, I was fully in the wind. My childhood dreams became my reality. I finally understood what the dream actually was, even though I had no idea as a boy. The dream was the “the walk-around.” And to this day, I do the walk-around on my bike before every ride. I circle the bike, inspect its parts, check the tire pressure, look at the brake pads, and check the tension of the drive chain. By doing the walk-around I get to know my bike; each paint scratch, engine tic, exhaust note, and point of tire wear. It is ritual to the ride. Homage to the machine. A prayer of safety on the ride. A moment of focus before the rush into the wind. 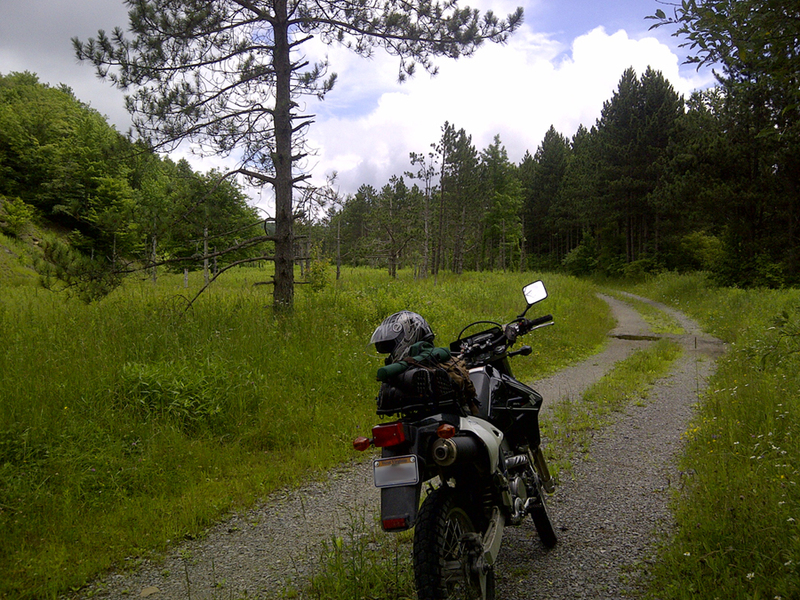 My years riding motorcycles have brought many adventures. I have logged tens of thousands of miles. I have ridden through beautiful mornings and more beautiful sunsets, temperatures over 100 and less than 30 degrees, incredible storms with wind gusts that truly put fear in my grip. Scenery that has left me amazed and teary eyed. I have laughed and cried and experienced the full-range of emotion all in the span of several miles. I spent 28 days covering over 6,000 miles, riding two-lane roads from West Virginia to Arizona and back. I have met more wonderful people while out on a motorcycle than I can recount. Being in a helmet for miles on end has an interesting affect on mental processing. You are forced to be in your head and “deal with it.” There is a wonderful saying I heard years ago: “You will never see a motorcycle parked in front of a psychiatrist’s office.” Being locked into a helmet is a fascinating experience. You are forced to confront yourself. I know that my friend Hack sings to himself incessantly. I can tell when it starts because his head starts to bob around a bit. Then the saddle dance begins. Have you ever seen a guy on a motorcycle traveling 70 miles per hour dance his way through “Gimme Shelter” by the Rolling Stones over the course of three miles? I have and it’s brilliant. I spent a number of years living in Phoenix, Arizona. 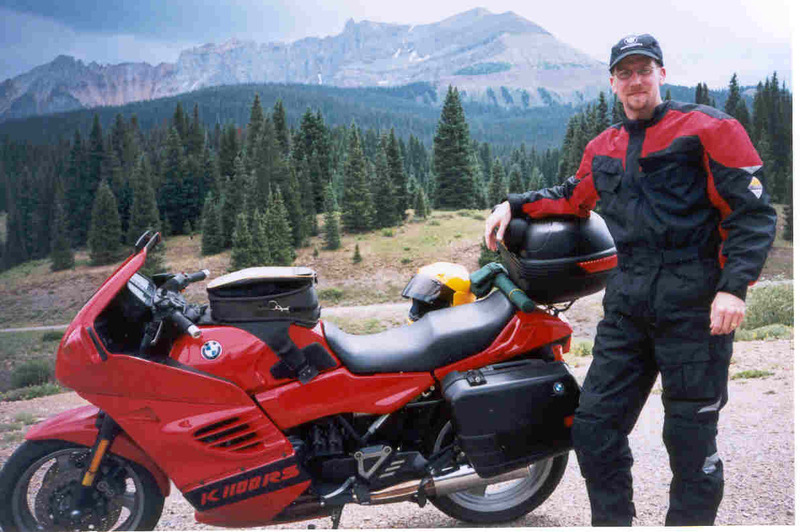 I owned a BMW K1100RS at the time, and would make weekend runs to Durango, Colorado to camp, fly-fish and ride. I usually left my house around 5 p.m. and the nine hour ride would end with me in a tent at the KOA outside of Durango around 2 a.m. The helmet became sanctuary on those rides. Thoughts would roll. Voices would echo. Prayers would be said aloud. The wind would mutter like a babbling brook. And I was forced to face my own thoughts, good and bad. Decisions were made, battles were fought, and the craziness that resides inside burst forth in moments of clarity, surprise, happiness, and even sadness. My thoughts always seemed at their zenith as I rode through the Navajo reservation in New Mexico late in the night. The stars were cold and bright and even at 80 miles per hour I felt I could see each one. Then Carl Sagan showed up and was muttering about “billions and billions of stars” and Arnold Schwarzenegger was saying something about “We’ve got to get out of here” and Julia Child, Ronald Reagan, Scooby Doo, and numerous others wormed their voices into my head through my helmet. It was always late and I always had another hour to ride. Robert Frost would creep in and speak of not loving walls and “miles to go before I sleep.” But I was in the wind and helmet time is always good. Me outside of Durango, Colorado. My life’s to-do list once had “get paid to ride a motorcycle” on it. That has been done and crossed off the list. In 2003 I was selected to be one of a group of riders to test ride Indian Motorcycles as part of their engine testing program. This program originated from the General Motors Proving Grounds and Test Facility in Mesa, Arizona. I spent six weeks riding Indian motorcycles, logging several thousand miles, and I got paid for it! I can honestly say that I didn’t dream of that as I kid. Through the years I have owned nine different motorcycles. From cruisers to crotch rockets, Hondas to BMWs. I had a 1973 Honda CB750 Four that had both an electronic ignition and a kick-starter. I loved to be the only guy in the parking lot to kick-start my bike. That always turned some heads. I have enjoyed all the bikes as they all have put me in the wind. Hack and I ride together to this day. We have countless hours in saddle time spent rolling down the road in friendship, laughter, and smiles. I have many friends who ride and I always seem to make new ones when out on the road. I have learned that it is not always about how many miles you ride, but what you see, do, and who you meet along the way. I met my friend Walt this summer while riding in the mountains of West Virginia and have adopted his riding mantra: “Accomplishing the most, in the least amount of miles.” Thanks, Walt. Words to live and ride by. I still dream of motorcycles and riding. I continue to gawk and stare at bikes. When I first started dating the woman who would become my wife, I told her, “I come with motorcycles. If I don’t have one, I am thinking about them. If I do have one, I will be riding and thinking about them. If you have an issue with motorcycles, you might not want to date me.” She didn’t have an issue. I have been found in the garage, just looking at my bike. Walking in circles around it, swimming in the smell, feeling the metal, imagining where the flying carpet will take me next. The motorcycle still evokes the magic I felt when I was a kid, the magic I knew had to exist when riding, in the wind, just like that mongrel dog in the sidecar.